Gilberte Interiors, Inc. Architectural Digest Design Show 2018 - Gilberte Interiors, Inc. 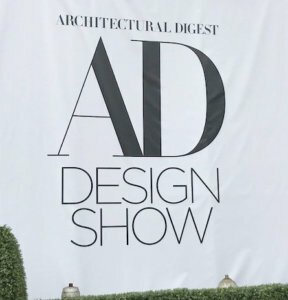 I always mark my calendar and look forward to the annual Architectural Digest Design Show in New York City. It comes at a perfect time—when it’s not quite spring up here, but I’m ready to be done with New Hampshire winter. The show is full of inspiring new innovations and designs. This year was no exception. The walk from the gritty urban landscape of the Piers in New York toward the crisp black and white graphics in the entry sharpened my senses and put me into design mode. I am never sure what the highlights will be or what new designs and introductions will catch my interest. The show is organized well, keeping Building Elements (fabrications in door hardware, stairs, and plumbing products), Lighting, Appliances, and Art and Furnishings in separate sections. The aisles are long with well-lit displays and I found myself retracing my path to get a second look as there was so much to absorb. The show featured more than 400 luxury brands, ranging from furniture to art, wall coverings, fixtures, and lighting. This year, for me, three categories stood out and captured my attention. Lighting: There were a handful of both manufactured lighting and hand-created collections that were truly innovative and which I know will enhance spaces that we are currently working on with our clients. 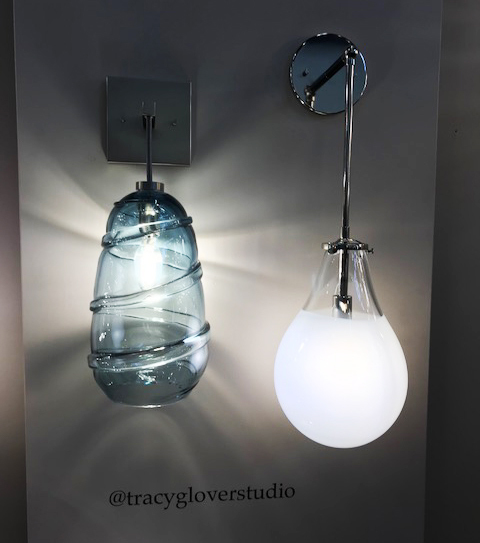 In particular, Tracy Glover Studio along with Siemon & Salazar have created amazing glass fixtures punctuated by simple attachments and fittings. I loved the finish and color options and how they work with these unique, artisanal glass pieces. Bath and Kitchen Fittings: Who doesn’t want to try something new in the kitchen or bath? I found fantastic new faucets, sinks, and accessories that not only give homeowners more practical solutions but offer us designers the shapes and finishes we’ve only imagined. While stainless steel is still an option, the offering of charcoal finishes on fixtures and sinks along with the reintroduction of stark white caught my eye, and I’m already envisioning designs that complement these new creations. 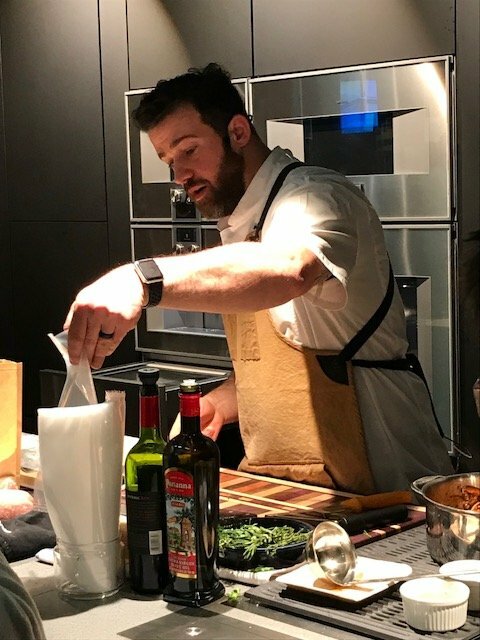 Kitchen Appliances: Stepping into the kitchen—and imagining future kitchens we could help create—I saw form and function meld together spectacularly to ease the challenges of cooking, cleaning, and storage for people with busy lives. I was thrilled to see that many of the appliance makers have embraced a philosophy of helping to keep your life simple and easy so your personal creativity can shine through. For me, the designs themselves were inspiring, and I would love to be able to create on that canvas and entertain guests in a space with those new pieces. 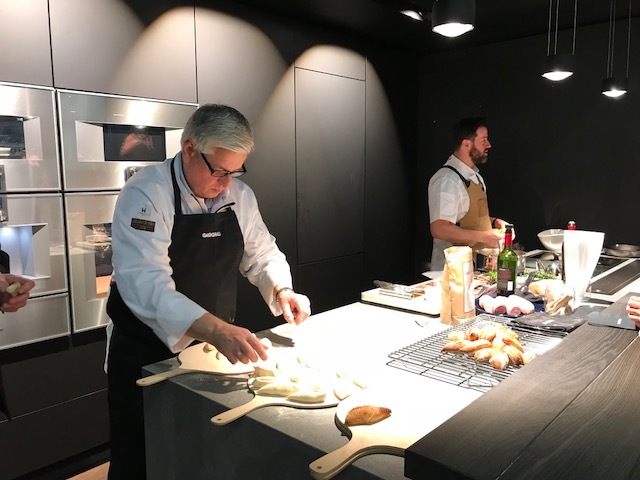 And if that didn’t already put me in the mood to cook, I watched a team of chefs use these beautiful new Gaggenau appliances to prepare some fantastic flatbreads and quick steam vegetables. I can’t wait to add some those touches to kitchens I’m working on—if not my own. Even if spring hasn’t fully flowered in the Upper Valley, the seeds of new designs are already sprouting in my mind, thanks to innovative products that are both tantalizing in their aesthetic appeal and more practical than ever.